Willistead Manor: Hiram Walker Didn't Live Here! What has been called a monument to the turn-of-the-century affluence of North America stands today as a reminder of the family that gave birth to the area of Windsor known as Walkerville. Designed by the famous American architect Albert Kahn, Willistead Manor was completed in 1906 and was home to E. Chandler Walker and his wife Mary (not his father Hiram Walker, as many area residents believe). Named for Chandler's older brother Willis, who had died as a young man, the manor was designed in the English Tudor style and features many different types of architecture as is common among these kinds of dwellings. Many Tudor homes in England were built centuries ago and renovated over time. During each renovation, the style of that particular period would be added, the end result being homes made of stone, then stucco and finally brick. Chandler and Mary had married later in life and did not have any children. When he died in 1915, Mary attempted to persuade her sister to move to Walkerville from the United States; she even had a home constructed adjacent to the Walker properties, but was unsuccessful. She joined her sister in the States and in 1921, the Walker family deeded the home to the town of Walkerville. The town used the Manor as administrative offices until 1935 when Walkerville amalgamated with Windsor. It continued as an administrative office and then a public library, as stipulated in the Walker deed. Between 1943 and 1975, Willistead became the original home of the Art Gallery of Windsor. By 1976, much of the exterior and interior portions of the Manor had fallen into disrepair. 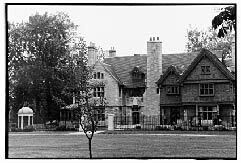 Windsor City Council decided that Willistead be designated for its historical and architectural value, that it be restored and renovated as a manor home for public tours, and serve as a meeting facility for private and public functions. A special act of the Ontario Legislature rescinded the original stipulation that a portion of the Manor be used as a public library. Funds for the restoration and renovation came from The City of Windsor, The Heritage Foundation, private donations, and a Canada Works grant. A citizen's committee was formed to garner private donations; the Ontario Government matched each dollar donated with funds through Wintario. Kahn's use of reinforced concrete and steel trusses, both radically innovative techniques for the time, meant that the full restoration of Willistead was a distinct possibility. Loaring Construction, the general contractor for Phase One of the restoration, was responsible for the extensive repairs to keep the weather out. The weeping tiles had been choked off by huge tree roots, some as large as branches, and portions of the foundation had to be broken up to access the tiles. In order to repair the chimneys, Loaring disassembled them stone by stone, put in new mortar and then rebuilt them one stone at a time in the same order. Much of the original metal in the copper drainpipes was restored rather than replaced. The roof is constructed of special tiles designed and built in the United States. Replacing the entire roof would have been exorbitant so the subcontractor, Margven Roofing, used tiles from the roof of the Gate House to replace missing or broken tiles. The Gate House's new roof is a more modern-day, less expensive version of the tiles. Elmara Construction was contracted for the interior work, Phase Two of the restoration. They sanded and refinished floors, repaired the fireplace in the Great Hall, refitted windows and rebuilt supports under the stairs so that they would no longer creak. Entering the Great Hall today, one is struck by its sheer size and grandeur. Measuring 23 feet by 39 feet by 13 feet high, the Hall is almost the size of a small house! The eye is drawn to the enormous fireplace, and then upwards to the impressive brass chandelier that had been stored in the basement of the manor for fifty years. The incredible ornamental woodwork throughout the house is testament to the patience and skill of craftsmen at the turn of the century. The Globe Furniture Factory of Walkerville was responsible for much of this work, as was Joachim Jungwirth of Detroit who did the fine handcarving including the newel posts of the main staircase. The Acquistions Subcommittee of the Willistead Committee has been responsible for the revitalization of the interior décor and furnishings. Louise Brown and the late Peter K. Ryan worked tirelessly with the assistance of a group known as Questers whose interest is to locate, restore and place antiques. The Walker family donated a number of pieces that had originally been in the house including a female statue, and portraits of the Walker family. Facilites for the handicapped were built, including a ramp at the front of the building, without marring the appearance of the exterior or interior of the Manor. In 1981, after three years of work and the investment of about $1.25 million, Willistead reopened in its new capacity. According to Alice Nemeth, manager of the Manor, the response to the metamorphosis was extremely positive. Private functions such as weddings, anniversaries, and memorial services are regularly held on the second floor and tours of the entire Manor continue to be popular. As we enter the next century and the new millennium, Willistead will stand as a testament to the foresight and perseverance of those who wished to ensure that this magnificent link to our past is preserved and celebrated in all its glory.